Deconstructing the Metabarons sheds light on the secrets surrounding the celestial clan of warriors, first introduced in the the seminal science-fiction graphic novel, which has become the cornerstone of the Jodoverse, The Incal. This encyclopedic reference book is packed with fascinating insights from the Metabaron's original creators, Jodorowsky and Mœbius, alongside revealing text, and rare and unseen preliminary illustrations from Juan Gimenez. 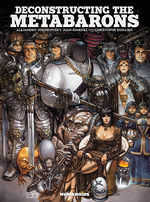 Discover the complexities of the Metabarons' sacred bloodline, traveling all the way their inception, through the tales of the intricacies of the expanded Universe and into the recent relaunch, The Metabaron.